Embarba pays special attention to detail in terms of lift manufacturing and decor, and furthermore, it is aware that customisation is an essential requirement for many clients. For this reason, its team is continually looking for materials which allow a wide range of finishes and designs to be offered which are able to adapt to the space. Floors, walls, button panels and ceilings are likely to require custom-made designs. In addition, the company looks for solutions which follow the same philosophy: companies which direct their efforts towards improving people´s quality of life, which also look for a high level of safety, aesthetic, durability, versatility and lightness. Embarba has chosen KrionTMfor the design of two of its cabins because of the wide possibility range of aesthetic adaptation which the mineral compact has. The thermocurved property of the mineral compact, its available wide colour range and its backlight property perfectly meet the specific needs that the lift company’s clients have. In addition, the KrionTM ease of cleaning and repair provides extra quality to the lift manufacturing. The result is a space which is 100% adapted to client demands, offering the high durability that is essential in spaces with medium-high traffic. The first cabin is manufactured entirely with KrionTM K · Life. The result is a pure white space which complies with the principles of optimal health and safety due to the zero porosity of the material that prevents bacteria proliferation. KrionTM in the Iceberg White 8103 and Cosmo Nature 0905 colours give shape to the second Embarba cabin. 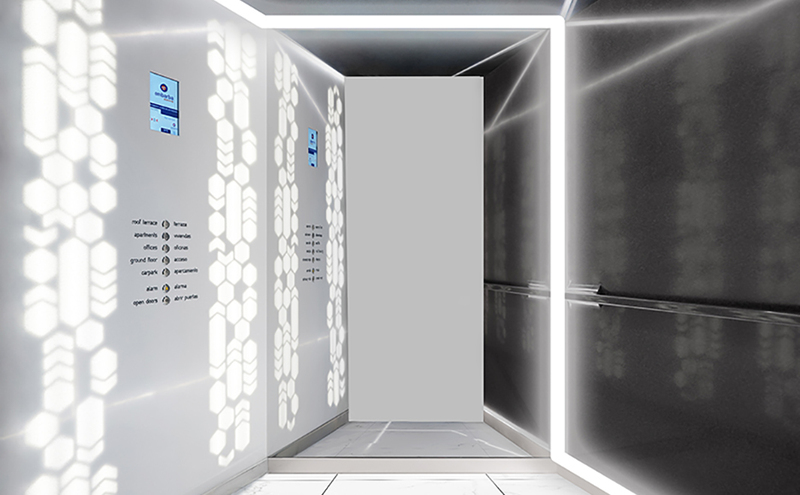 The two lifts use backlit effects both aesthetically and informatively, with customised signage and light effects. The result, aesthetically and functionally, meets the high quality standards which Embarba looks for, regarding its clients. A custom-made space that has the attention to detail that follows the client’s guidelines and, it goes beyond offering a safe and efficient environment.